Present Loves...Past Lives... and Danger Everywhere! Robyn Delaney doesn't believe in the supernatural and is beginning to believe that true love is just as much of a fantasy. 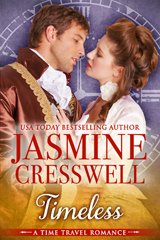 Then the intrigue that surrounds her boss, Zach Bowleigh, thrusts her into danger ... and into 18th-century England. She finds herself in a place that cannot possibly exist, and yet it does, with the flesh-and-blood reality of Zach's coldly handsome ancestor, William Bowleigh, Lord Starke. And William seems to be in just as much danger as his descendant.